The highest of high concepts entertains but leaves you asking a minimum of twenty questions. In Time proposes a future where currency is determined not by money but by lifespan. At age 25, everyone stops aging but are given only one year before death unless they can earn more time. The countdown termination clock on their forearm keeps everyone working and trading for more time. Justin Timberlake plays Will Salas, a ghetto boy in Time Zone #12 whom like everyone else in the zone is a slave wager. But he inherits a century of time from a Time Zone #1 benefactor / suicide case. Olivia Wilde is Will’s 52-year old mother, Cillian Murphy is the policeman a.k.a. Time Keeper, and Amanda Seyfried is the beautiful heiress daughter of a capitalist. Writer-director Andrew Niccol (“Gattaca,” “Lord of War”) works in lots of shoot-outs and chases that are well-crafted but might leave you wanting more political drama. There is an overabundance of questions to nitpick so it would be endless to get started. And yet helplessly in lieu of my need to vent, I will select a few. What do the rich people in Time Zone #1 do all day to satisfy their human purpose? All the Time Zones referenced in the movie all apply to Los Angeles, but what is it like in Arizona, New Mexico, etc.? Do Third World countries all adhere to the youth commodity? What’s an eerie turn-off however is seeing how every human being has a green neon digital read-out imprinted beneath the skin of their left arm. It’s akin to a permanent tattoo of a digital watch. This is the kind of cinematic entertainment that leaves you with cynical ugly thoughts despite your curiosity to keep watching. Yet I was intrigued throughout, but often with hopes the film would provide perceptive answers to my queries. The whole movie fits the bill of a favorite unofficial genre of mine, the Race Against the Clock thriller, with our hero constantly on a rush even with a century guaranteed on his arm. See, the Time Keepers want to accuse Will of murder and therefore delete his stolen time. Taxes and the cost of living are constantly rising to oppress the poor (a cup of coffee is four minutes off your life, a bus ride is two hours). Time thieves everywhere operate to take away from lives with too much surplus of time. This left me with the most troubles. Anybody from anywhere can just attack the weak and steal their time by sort of an arm-wrestling move that allows time to transfer from one to another. It’s not convincing as portrayed that the Time Keepers are a large enough staff and effective enough to deter criminals. And besides, who is their allegiance to? The movie did not allude to any form of government other than the wealthy have a plentitude of time and they want to keep it that way. When we get a chance to meet the rich we understand life is easy for them and time is not a concern. But how do they occupy themselves other than dining, drinking, and superficially socializing? I can’t help but to utter this question: Don’t these people vacation anywhere? When Will courts the beautiful Sylvia (Seyfried) he learns of how empty, narrowed and unadventurous life is for the wealthy. So unadventurous that Sylvia is surprised by Will’s swim in the ocean, considered to her as a form of reckless endangerment. Naturally, Will and Sylvia transform into a Bonnie and Clyde of sorts, becoming bandits of Time Lenders brokers and giving expanded lifespan to the poor. All of this action is diverting, yet it is truly annoying when the two of them forget to give time to themselves. There are countless scenes of these two looking at their digital read-outs approaching double-zero. The last thing we needed was Will and Sylvia to worry about that, byway of script contrivance. 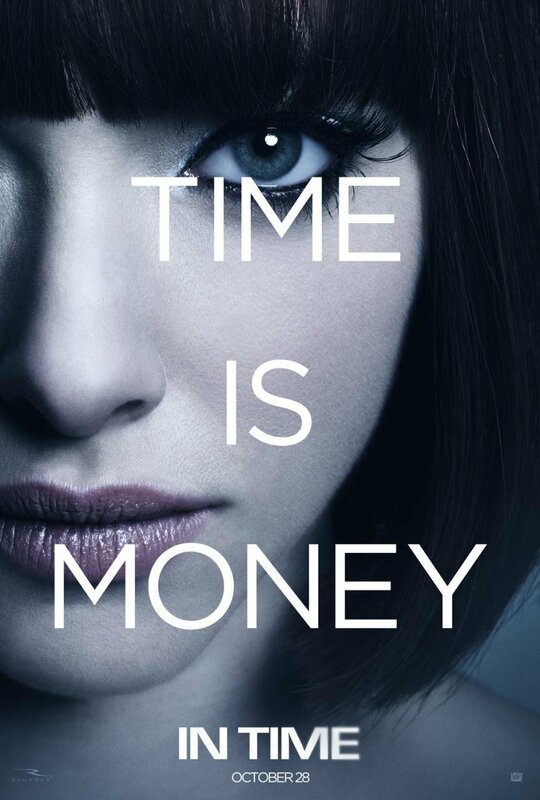 “In Time” disappoints but I still was involved the whole way, often self-amused by my own brainstorming of what story possibilities might have enhanced this film’s potential. Film Cousins: “Soylent Green” (1973); “Logan’s Run” (1976); “Gattaca” (1997); “Minority Report” (2002).